Do you sing in the shower, but yearn to take to the stage? Maybe you like sing-alongs with your kids? Or maybe you’re an experienced performer? 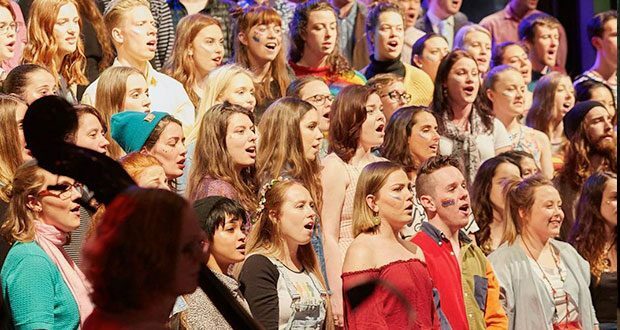 Regardless of your singing prowess, you are being asked to lend your voice to a pop-up community choir in Swan Hill this September. In Full Voice is a community singing event that will be professionally filmed and shared around the world via social media. It will be held on 18 September as part of the Fairfax Youth Initiative. “Together we will learn a specially created arrangement of Bridge Over Trouble Water, mixed with John Lennon’s iconic Imagine,” Fairfax Artistic Director Bryce Ives said. “We’ll share a video recording via Facebook the week before, to teach you the song, and you will be able to download sheet music. The video clip will be shown at the Fairfax Gala in Swan Hill, before being shared via social media. “The theme for Fairfax 2018 is ‘We become the stories we tell’. We know that singing is central to storytelling as the most ancient and original form of storytelling. Nothing else can ever quite reach the ecstasy of singing joyously together, united as a community,” Mr Ives said. Also on 18 September, Word of Mouth – a vocal ensemble of students from the Ballarat Arts Academy’s renowned music theatre program – will perform a free pop-up concert at Swan Hill Regional Art Gallery. “Word of Mouth performs a wide repertoire of music – they are like a big band of voices, freewheeling between contemporary, classical, jazz, music theatre, and choral theatre,” Mr Ives said. Find out more about both events on Council’s Facebook page.